One Year Later, Did Microsoft (And Friends) Keep Their E3 2014 Promises? The gaming year’s biggest planned spectacle, E3, happens next week, which means that it’s time for us at Kotaku to once again check what the big console makers promised at E3 a year ago. Let’s see how Microsoft did. 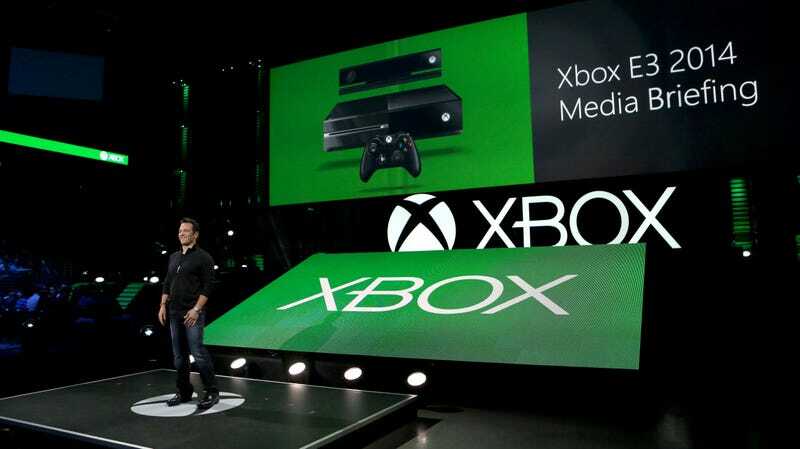 The Xbox maker had a simultaneously humble and aspirational press conference last June. They thanked fans for feedback about the Xbox One and presented a big swath of upcoming games. At the time, the Xbox One console was rapidly getting improved through monthly firmware updates, something Microsoft’s Xbox chief Phil Spencer, referenced as he kicked things off. That sense of flux might as well have been the theme of the entire event. Usually, when we check in a year later, we find that companies delivered on most of what they put forward. Checking in on this one a year later, however, reveals quite a few moments of overreach. None of it seems ill-intended. Release dates slip. Games change. Projects fall apart. That’s the truth of how games are made. If the results are a generally high quality output of games whenever they finally do come out, all the better. We do this series, though, to help ground everyone in the reality of how things actually happened, to help you balance the excitement of an E3 press conference with the perspective of what becomes of all the hype..
Did they deliver? Yes. They showed 90 minutes of games and only briefly mentioned one non-game, the video series Halo Nightfall, in the context of it being part of the Master Chief Collection. No big deal there. Clearly Microsoft wanted to further reinforce the idea that the Xbox One was more of a game console than it was a replacement cable box, a departure from some of their showings the previous year, before the console came out. The promise: The show kicked off with a demo of the newest Call of Duty and the promise that “Xbox owners will be the first to play all of the add-on content” for Call of Duty: Advanced Warfare.” The game’s launch day: 11/4/14. Did they deliver? Yes. Call of Duty release dates don’t slip. The game came out on 11/4/14. Xbox One and Xbox 360 owners have indeed gotten access to DLC packs for Advanced Warfare about a month before they’ve been released for PlayStation platforms and PC. The promise: The famed race track Nurburgring was going to make its next-gen debut in Forza Motorsport 5 which would be available on the day of briefing and free. Did they deliver? Yes. The track had not appeared in any other new-gen game and did come out that day as free DLC. The promise: The newly announced Forza Horizon 2 would have a bigger and more diverse car list with over 200 cars. The game would be built for Xbox One on Forza Motorsport 5’s graphics engine, with a full day-night cycle, and would introduce dynamic weather all in 1080p. It would run on dedicated servers, have no lobbies, support Forza 5 “drivatars,” have clubs with up to 1000 members each, and be out exclusively “on Xbox” Sept 30. Did they deliver? They did. The first Forza Horizon would eventually get more than 200 cars through DLC, but Forza Horizon 2’s launch-day car list was far longer and indeed more than 200 entries long. The game came out for Xbox One and Xbox 360 on September 30, though that 360 version didn’t get any mention at the press conference. The game looked great, but references to the Xbox One version being built on the same engine as the Xbox One-exclusive Forza 5 may have obscured the fact that this was a cross-gen game. It was nevertheless a beautiful game, running on Xbox One at 1080p as promised (and 30 frames per second), with the planned day/night cycle and weather. The promise: A brief presentation for the 2K-published game Evolve promised an exclusive beta for Xbox One owners in the fall and DLC first on Xbox. Did they deliver? Sort of? Like many things with Evolve, you need a whiteboard to keep track of this. The game was delayed from October to February, so it didn’t hit fall, something implied since the game was showing up in the part of the Xbox press conference dedicated to 2014 games. The beta was also delayed and finally kicked off as an open beta for Xbox One users starting January 15. It lasted four days. As for the Xbox exclusivity of that beta, there were smaller “closed technical tests” for select PC and PS4 users that started on January 16 and 17, respectively. There had also been an Evolve alpha in October, seemingly as a make-good for people wanting to play at least some version of Evolve in 2014. That alpha lasted four days for Xbox One owners. It started a day later for PS4 and PC owners. As for DLC coming first on Xbox, well, the notoriously complex pre-order offerings for Evolve do show that Xbox One owners got some special perks, but only some of the DLC offered in the game’s big March 2015 update—specifically, two free maps—was Xbox-first. The promise: Ubisoft folks presented a playthrough of a level of Assassin’s Creed Unity on stage, a notable moment for a series that had long been giving PlayStation-exclusive DLC. The game’s producer Vincent Pontbriand said Unity would offer “our biggest playground ever, filled with hundreds of quests, activities and rewards,” before showing off what he called an “exclusive gameplay demo” of the game. Did they deliver? Uh...hmm. Unity’s Paris is absurdly large but not as vast a map as seen in the previous year’s Assassin’s Creed IV: Black Flag. Most of Black Flag’s playground, though, was the Caribbean sea on which you could sail and perforate enemy ships. Does that count as bigger, or is Unity bigger? Maybe it doesn’t matter. Does it matter, though, if the Assassin’s Creed Unity level demoed at this Xbox press conference—the assassination of the Marquis De Bullion—wasn’t actually in the finished game? We’ve never seen it in the game and can’t find references to it making it in there. You be the judge. The gameplay in it resembled the kinds of things you could do in the game Ubisoft shipped. The only eyebrow-raiser is a scene where a French crowd rushes in, as if you’ve incited them to action, something that doesn’t happen like that in any missions we on staff can recall. The promise: From EA... “Premiere content first on Xbox” for Dragon Age: Inquisition, a game that would be launching on October 7. Did they deliver? Slight delay. Let’s make that release date November 18! As for the “premiere content” phrase, note the language. Free shop expansion? That came out for all platforms on the same day. Substantial, single-player expansion the likes of which you might expect from a Dragon Age or a Mass Effect’s DLC? Xbox One got that in March (same day as PC, for what that’s worth! ), two months before it was slated to come out on Xbox 360, PS3 and PS4. The promise: Sunset Overdrive, a new game from Insomniac, would only be on Xbox One and ship on October 28. Company president Ted Price went and played some of it on stage and then hyped the game’s eight-player Chaos Squad mode. Did they deliver? Yes, the game hit the release date, is Xbox One-exclusive and has that eight-player mode. If you’ve played the finished game, you’ll find the section that Price played through to be typical of the game’s action except for the fact that the enemies Price killed don’t appear to be dropping tons of loot. The promise: An expansion for Dead Rising 3, Dead Rising 3 Arcade Remix Hyper Edition EX Plus Alpha, would be available right then, only on Xbox Live. Did they deliver? They sure did. The promise: Harmonix co-founder Alex Rigopulos appeared on stage to mention the planned October 21 release of Disney Fantasia for Xbox 360 and Xbox One and the digital-only September release of Dance Central Spotlight for Xbox One. He promised that new tracks would be able to be added into the game faster than ever before. Did they deliver? Yep. Fantasia hit its release date. Dance Central came out in early September and received a greater flow of new tracks over the next few months than its predecessor had. The promise: In a presentation for Fable Legends, developer David Eckelberry narrated a co-op mission and highlighted an option for a fifth player to play as a villain with a god-view perspective of the game. A multiplayer beta would begin in the fall. Did they deliver? Pretty much. The game isn’t out yet but had a closed beta in the fall. Fable Legends was presented during the part of the Xbox press conference that pertained to 2014 releases, but it’s up to you whether you think the release of the beta counted. The promise: Project Spark, the game-creation tool only on Xbox and PC, would get multiplayer, co-op and galaxies expansions and something related to Rare mascot Conker the squirrel. Did they deliver? Yes. The game got co-op, multiplayer and, in November, a Galaxies expansion. The Conker stuff came out this past April. The promise: Ori and the Blind Forest would be out “only on Xbox One” in the fall 2014. The promise: The studio head for Halo development team 343 Industries talked about Halo 5 Guardians launching “next year.” She then said, “On November 11th, 2014, for the first time ever you can play the entire Master Chief saga on a single console, the Xbox One with Halo: The Master Chief Collection.” Following her was the collection’s executive producer, Dan Ayoub, who said, “The collection features ... all four games, with everything unlocked, on one disc in a single seamless interface so you can play the Chief’s journey however you want.” He talked about the game having custom playlists that would let players combine moments from all four games. He said Halo 2 would get the “full Anniversary treatment” of improved graphics. He pledged that all of Halo 2’s multiplayer would appear “exactly as it shipped 10 years ago” along with six Halo 2 maps recreated for Xbox One. The collection overall would have over 100 multiplayer maps, all running on their original engines, all in 1080p at 60fps on dedicated servers. The collection would offer 4000 gamerscore points across all four games’ Achievements. In some way it include the live action project Halo Nightfall and provide access to a December 2014 Halo 5 Guardians beta. Did they deliver? As best we can tell, all the numbers here check out. It is probably nitpicking to point out that the MCC didn’t all come on a disc. There was so much content that Microsoft had to mandate an extra 20GB download for what couldn’t fit on a Blu-Ray. What about the December beta for Halo 5? Clearly anticipating the very article that you’re reading, Microsoft launched that on December 29, with just two days to spare. Here’s the thing: the Master Chief Collection did come out on its promised release date... but is it great that it did? The game’s multiplayer was a buggy mess for many players for weeks and didn’t seem to be running reliably well across the board until early 2015. The promise: Back on stage, Phil Spencer said we’ll be able to play everything we’ve seen on Xbox One this holiday. Did they deliver? As mentioned above, not completely. Some of the games he talked about slipped into 2015. It happens. The promise: The next game from Playdead, the creators of Limbo, would be released in early 2015. It would be called Inside. Did they deliver? No. Playdead recently pointed out that Inside would miss its initial release window. So it goes. The promise: Chris Charla head of ID@Xbox talked up indie games, many of which he said would debut console-first on Xbox One. He rattled off a bunch before a video reel highlighted even more. The games mentioned or shown were: Massive Chalice, Aztez, Knight Squad, Plague Inc Evolved, White Night, Earthlock, Cuphead, Hyper Light Drifter, Lifeless Planet, Slash Dash, Fru, Lovers in a Dangerous Spacetime, Mighty No. 9, Grave, Threes, Fenix Rage, Woolfe, #IDARB, Hellraid, and Below. Did they deliver? Well, there wasn’t much of a promise here, and anyone who has followed the development of indie games must know by now that they take as long to come out as big-budget games. Massive Chalice just came out for Xbox One (it’s free for Xbox Live Gold users this month) and has no official PlayStation release date. Lifeless Planet also recently came out for Xbox One and not on competing consoles. Same deal with #IDARB and Threes, the latter of which is also out for phones. Aztez, Earthlock, Cuphead, Hyper Light Drifter, Slash Dash, Fru, Lovers in a Dangerous Spacetime, Mighty No. 9, Grave, Woolfe and Below aren’t out yet. Knight Squad and Plague Inc are only available right now as Early Access games on PC. Fenix Rage is only out for PC now, too. White Night came out in March, its PS4 version beating the Xbox One version by a few days. Development studio Techland recently put work on Hellraid on hold. The promise: Two developers from CD Projekt Red showed gameplay of The Witcher 3 and said players would be able to traverse to any viewable location, to the mountains in the distance and beyond. Did they deliver? Witcher-playing Kotaku staffers say that the inventory screens shown in the game demo are different than what shipped. That’s no shocker. As for the go-anywhere promise, the game is enormous and you can go to the mountains, so... yes? There are invisible walls, because the game is not infinite, which people watching this demo probably assumed. The promise: Ken Lobb, a creative director for Xbox, said that Microsoft was bringing back original Xbox franchise Phantom Dust, this time for Xbox One. Did they deliver? Not yet, as we explained through our reporting about the troubled project. Sources told us that the independent development studio that was then working on the the Phantom Dust reboot were not involved with the trailer that debuted at E3 and were surprised when it ran. That studio eventually lost Microsoft’s support and had to shut down. Did they deliver? The game isn’t out yet and was recently pegged by Ubisoft as an early 2016 release. The promise: Hideki Kamiya, a game director at Platinum Games, introduced a new game, Scalebound, which was presented as an Xbox One exclusive. Did they deliver? It’s not out yet, so not applicable. The promise: Original Crackdown lead creator David Jones showed up to promise a new Crackdown that would be exclusive to Xbox One, feature a campaign that could be played with co-op and have competitive multiplayer as well. No release date. Did they deliver? Not his fault that Battlefield Hardline slipped to 2015, but otherwise, a good accounting of what Microsoft tried to pull off for the holiday season. Whether they delivered, you decide. And that was that. We’ll be checking Nintendo and Sony’s E3 2014 promises later this week. To contact the author of this post, write to stephentotilo@kotaku.com or find him on Twitter @stephentotilo. Top photo by Casey Rodgers/Invision, AP Images.